Computer system for pattern construction and grading of clothes, furniture, shoes. I want to be notified for new versions! Download in progress. Please, wait! Silhouette Designer 3 - Unleash your talent! Developed to make our clients more competitive on the market by providing them the modern technologies in the apparel design. 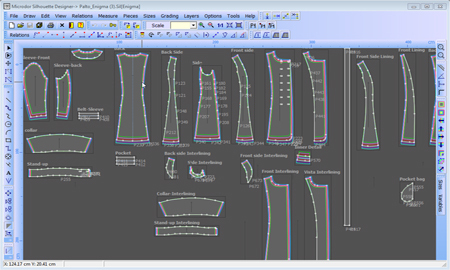 Silhouette Designer is software for constructing and sizing of apparel models, upholstery, shoes. Meant for small, medium and big companies manufacturing clothing and sewing ateliers. Our software product saves time and resources to designers as it replace the ordinary drawing sheet with computerized one. Allows conservation of huge number of constructed models which can be opened and continued anytime or to be used for a base for new patterns. Through the Internet technologies the created patterns can be easily transfered over long distances and variety of combinations of different models can be done. Through proper alignment of details on the fabric, thanks to the modular part Silhouette Marker, time and resources are successfully saved. Grading the patterns with size rules or size tables. Nesting the patterns in marker and calculating the expenses. Import and export to other file formats. Print and cut of the patterns and markers. Palette with element patterns for often use. Silhouette Designer supports work with plotter and digitizer. Computer with processor Pentium minimum 500 MHz. Recommended is 1 GHz and processors Intel Pentium/Celeron,AMD K6/Athlon/Duron or compatable whith them. Visit our office for demonstration of the product work!